Mcdonald’s inspire Moschino – Fast Food Fashion! Home/Fashion, Restaurants, Takeaway/Mcdonald’s inspire Moschino – Fast Food Fashion! Who would of ever of thought about mixing fashion and food together to create a whole new fashion collection. We have already seen food captured within art, where Andy Warhol incorporates food into his artwork, such as the famous Campbell Soup. 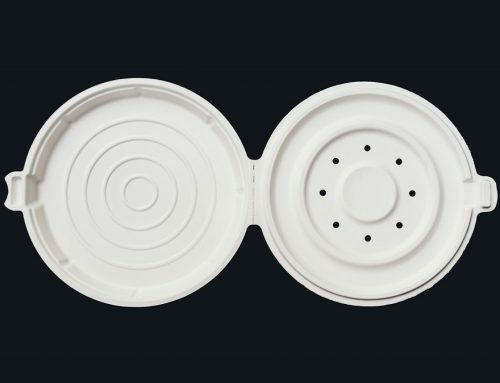 Will this years latest fashion collection be so easily consumed by its customers as fast food can be? Moschino is an Italian luxury fashion brand that was founded in 1983 and is renowned for its fun, colourful and unique fashion designs. Moschino’s latest runway show at the Milan Fashion Week, for their Autumn/Winter 2014 collection, shows the collection being very much influenced by the branding of McDonald’s, along with other food brands such as Cheetos, Hershey’s and Kellogg’s Fruit Loops. Bringing food into fashion gives fashion a sense of having fun and with these childlike brands, always being young at heart by wearing fashion. With this latest collection, Moschino is giving it’s customers the opportunity to buy certain products to not only show their love of the Moschino brand, but also the love of other well known food brands. The fashion show was all about fast fashion and what better way to mix fast fashion with fast food. Moschino have cleverly infused there iconic heart shaped “M” with the McDonald’s famous Golden Arches “M” logo. 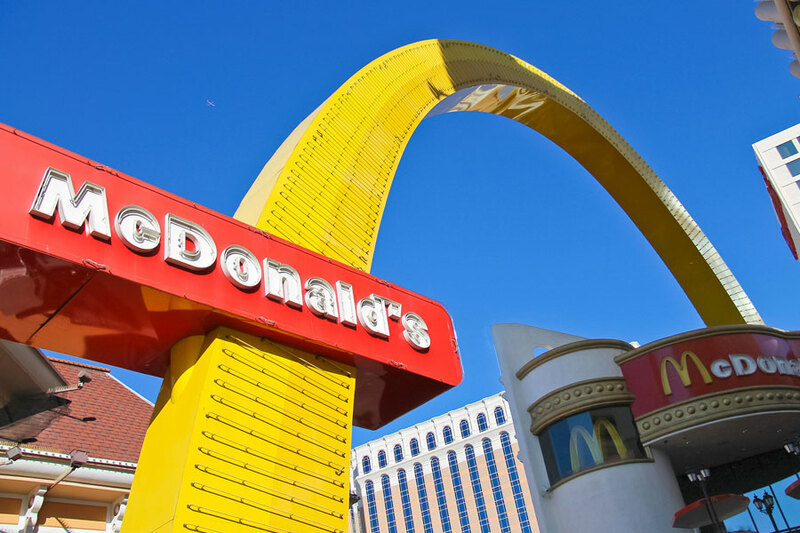 The colour scheme also portrays McDonald’s branding with the bright red and yellow colour scheme. Some people will agree that most clothes shown on the catwalk will never be seen on the high-street as they are so over the top and is mainly used for inspiration, however with the fun designs that Moschino have put together, this may make the lovers of Moschino want to actually buy into this new collection, especially with the fun accessories that have been designed. Moschino make the most out of their accessories by making “Happy Meal” shaped bags, milk shake shaped bags as well as quilted red bags with a large yellow Moschino logo symbolising McDonald’s. The shoes also contained the yellow Moschino logo with the colour palette of red and yellow, along with other accessories such as the baseball caps and bold yellow earrings. 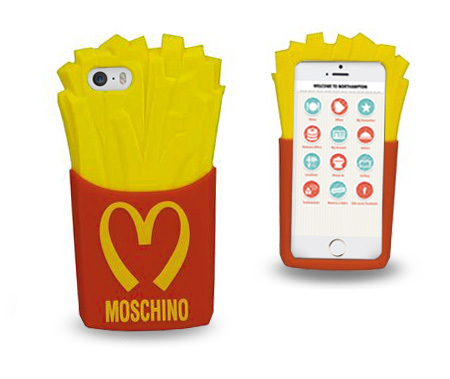 Moschino have even created an iPhone 5 case in the shape of McDonald’s fries, already an item that has sold out on the Moschino website. Any Autumn/Winter fashion collection for various designers will usually contain strong animal prints, with Autumn being the time of year leopard prints come back around. This year Moschino have combined that with their animal prints to represent the McDonalds milkshake, with large black and white cow prints, along with a milk shake shaped bag. Autumn/Winter usually has quite a dark colour palette, but Moschino have gone against this with their bright colours of red and yellow, along with some darker colours of black with gold and mid denim blue. Overall the Moschino collection gave a very 1980’s pop feel to it, meaning we could see the return of the 1980’s fashion sense again. At Fashion shows there is always a competition between designers on who can “wow” the audience with their seasonal collections. Most fashion designers will stay safe, going with the carefully selected colour palette of the season and will show this in a somewhat eccentric way. Moschino has definitely won the “wow factor” they have gone with various colour palettes and added some well known and loved fast food and snack food brands. To prove how popular this collection was, certain products have already gone on sale online and in some stores and are ultimately already sold out. This is definitely something that fashion and maybe even food lovers will be eager to go and buy as soon as the Autumn/Winter season arrives this year. Given the facts its safe to say that fast fashion can be so easily consumed as fast food, it’s just a matter of how long for. To view the collection on the Official Moschino website please click here to follow the link to the Moschino McDonald’s inspired collection.